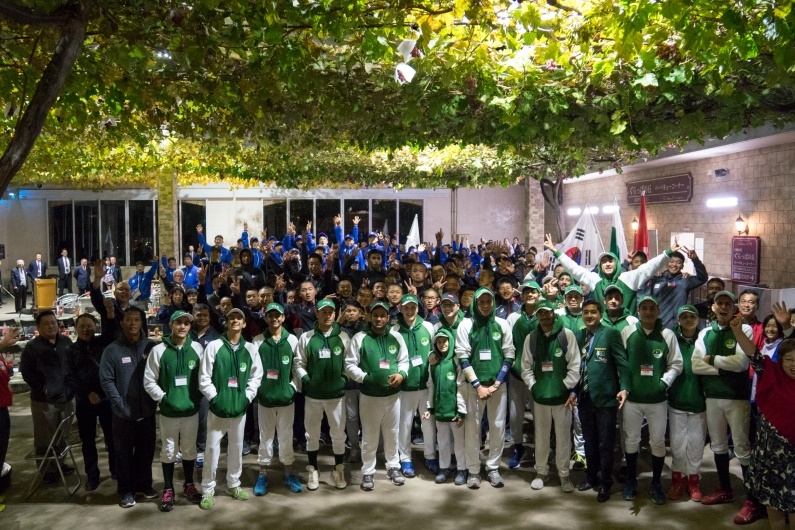 IZU CITY, Japan – The top youth players from six nations are set to compete and represent their countries in the IX Baseball Federation of Asia (BFA) U-15 Championship, which opens Wednesday, 1 November, at Izu City’s Shida Stadium. The IX BFA U-15 Championship is being hosted by the Baseball Federation of Japan (BFJ). Chinese Taipei is the three-time defending U-15 Asia champion and has won six of the last seven titles. At the Opening Ceremony held at the Reception Hall of Shida Winery Complex overlooking glorious Mt. Fuji before the sunset in the late afternoon of October 31, President Tom Peng who is 1st Vice Chairman of Baseball Division, WBSC, thanked the hosts, wished luck to participating players and emphasized significance of this tournament ahead of 2020 Tokyo Olympics. President Tsutomu Shida (83) of Japan KWB Baseball Federation, the driving force of this event, echoed BFA President Peng’s remarks adding that this competition promotes international friendship among children through baseball. At the conclusion of the Opening Ceremony, children and the guest broke out in cheers to fireworks set off from the vineyards. The 15-game, round-robin tournament for the Asian title includes world No. 1 Japan, No. 3 Korea, No. 4 Chinese Taipei, No. 26 Pakistan, No. 35 Hong Kong and No. 47 Philippines. The final standings will be based on each team’s overall win-loss record in group play, which ends on Sunday, 5 November. The winner and 2nd Place finisher of the BFA U-15 continental championship will advance to play For the Title of World Champion at next year’s WBSC U-15 Baseball World Cup.